This is going to prove hugely provocative, but it needs to be said anyways; we should be applauding President Trump’s authorization of military strikes against the murderous regime of Syrian dictator Bashar al Assad. Given the commander-in-chief’s inability to command anything, it is hard to write those words, but it is also necessary. Yet buried deep within the cacophony of noise from the punditry and the bloodsport take no prisoner social media contests over the last 48 hours, there is a signal waiting to be found. What is the signal? Before we journey to find it, we’ll have to decipher some of the complex realities which govern normative international relations theory. However, before we get to that, I can simply say: You cannot massacre your own people with chemical weapons. For those who are taking full advantage of the first real spring weekend in the Commonwealth (or the Action Patrol reunion gigs) and might have missed the headlines, here is a quick recap. At around 8:30 PM on Friday evening with support from British and French allies, the US military launched a multi-axis attack on chemical weapons facilities inside of Syria. According to the Pentagon briefing on Saturday morning, 105 missiles were launched in a combined naval and air campaign – from the Red Sea, North Arabian Gulf, and Eastern Mediterranean. The briefings also suggested that all assets landed on their intended locations and targeted research and storage facilities that produce and store chemical weapons. This strike was in response to a chemical attack launched by the regime on April 11 in Douma, a Damascus suburb, which killed 70 people and wounded over 500. 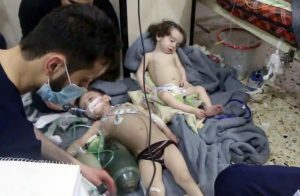 Yet this was not the first chemical attack by the regime. There is documented evidence that the regime first started using these weapons against their population as far back as December 2012. Then in August 2013, there was a sarin gas attack that left an estimated 1,400 people dead. Video image by the Syrian Civil Defense (White Helmets) of the April 11, Chemical Attack. Time for some of that tediously boring international relations theory: All foreign policy is a calculated long game, one that must effectively balance hard (military) and soft (diplomatic and economic) power over the course of multiple years – sometimes even decades. When then President Obama failed to enforce his “red-lines” on the usage of chemical weapons in August 2013, he opened up a vacuum (like nature, international relations also abhors a vacuum). This vacuum was filled by bad-actors such as Russia and Iran who have a strategic long-game and are not afraid to use all means available to them – chemical weapons included – to achieve their goals and objectives. Most foreign policy professionals will agree that the failure to enforce the Obama “red-lines” was a disastrous decision for our emerging strategy in Syria. Former Secretary of State John Kerry even went so far as to say publicly in 2016 that “it cost us significantly” in terms of resolving the conflict. Unfortunately, the problem is that without the threat of force, the Syrian regime never really had any incentive to dismantle their chemical weapons programs. Where does that leave us now in 2018? Let’s circle back to the signal buried in the noise. The coalition strikes against the chemical facilities of the Syrian regime had to happen, the same way they should have happened in 2013 after the sarin gas attack. 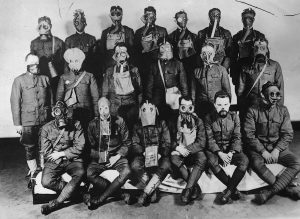 There are prohibitions against the usage of chemical weapons going back to 1925, commonly referred to as the Geneva Protocol. Why? Because the extensive use of these agents during WW1 led to the deaths of an estimated 100,00 combatants and wounded up to a million more. This international convention was reintroduced in 1997 as the Chemical Weapons Convention, which prohibits “the large-scale use, development, production, stockpiling and transfer of chemical weapons” – the Syrian regime is in violation of most if not all of these conventions. So the problem is less about the righteousness of taking out chemical weapons facilities, but having to reconcile it against the entire Trump presidency. He actually said, “mission accomplished” in a tweet in a bout of mind-mumblingly cliched braggadocio. Anyone remember George Bush saying the same thing about the Iraq War? Anyone else wanna comment on how that turned out? The first thing to remember is that chemical weapons deployment is a method of waging war which cannot be normalized or accepted by the community of nations. Yes, countries will continue to wage war and yes, the methods in which they wage war will still end with countless civilian lives lost in the process. But there is a difference, which is the reason why we also have prohibitions against the use of biological and nuclear weapons. Chemical weapons and their capacity to kill civilians at a disproportionately higher rate is what separates them from other conventional weapons. According to an analysis by the Carnegie Endowment for Peace, “Under ideal conditions 1 ton of Sarin dropped from an airplane could produce 3,000 to 8,000 deaths”. They are also indiscriminate in their usage, given the inability to control the agent once it has been dispersed, making them not only a weapon of mass destruction, but also a weapon of mass terror. The same analysis also cited a UN report which claimed, “a chemical weapon of 15 tons might kill 50 percent of the people in a 60 square kilometer area.” Then there is the long-term effect of the chemical agents, such as visual impairment, chronic dermatological conditions, long-term respiratory problems, and cancer. To assume that “red-lines” on chemical weapons should not be enforced, would be to assume that the very same “red-lines” on biological and nuclear weapons should also not be enforced – should that terrifying scenario ever come to pass. Is this something we’re willing to negotiate on as the world becomes more complex and dangerous? That is the conundrum we’re facing and the reason why we cannot allow chemical weapons attacks to go unanswered -Trump or no Trump. There is no strategy for Syria (not under Obama, not under Trump) and this strike, like the US strike in April last year, was only a tactical pin-prick meant to degrade capabilities not end the conflict. That does not mean we have to let Syrian civilians be killed with weapons of mass terror by a murderous regime that has wholesale slaughtered its own people since 2011. Trump is a reckless, loutish president, but in authorizing the Pentagon’s strikes on Syria he was justified. Our feelings on foreign policy should not be conflated with our feelings about the president – remember the long game. Nonetheless, there is a bitter irony to all of this. The man who said there were a “few good people” in Charlottesville and the man who demonized refugees is also the same man who can intervene to save civilian lives from chemical attacks. Regardless of the reasoning, the net result can still be the same: countless lives have potentially been saved by destroying facilities used to make weapons of mass destruction. If ever there was a reason for the awesome power of the US military apparatus to be applied, this is surely it. Progressives who are committed to cooperation among allies and internationalism, as a means of supporting human rights can support this kind of intervention without supporting the president. These two things can exist simultaneously. Fingers crossed this kind of attack won’t happen again, but recent history has shown us that without consequence there is little hope that we won’t have a repeat of it. Syria continues to be the great humanitarian tragedy of our generation. According to I am Syria, a website that tracks casualties in Syria, over 500,000 have been killed with 10,204 reported civilian deaths in 2017 alone. The United Nations High Commissioner for Refugees (UNHCR) has also estimated that since the start of the Syrian civil war in 2011, over 5.4 million people have fled their country as refugees with millions more displaced internally. The Syrian civilians caught in the middle continue to experience violence from the regime of Bashar al-Assad, independently ran militias who act as the regional proxies of Iran, Russia, and Saudia Arabia, along with terrorist groups such as the Islamic State. As a result, Syria has been broken up into a series of enclaves or cantons that are ruled by whatever militia or rebel groups have established dominance in that particular area with territory changing hands on a regular basis. 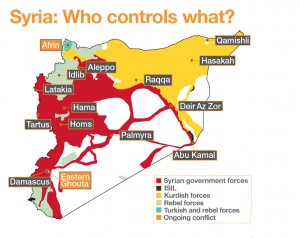 Al-Jazeera recently released a conflict map that showed the various enclaves within Syria and while the Syrian regime has reclaimed significant territory from various rebel groups, the largest independent region in Syria now belongs to Kurdish groups who control vast swaths of North and North Eastern Syria. The Kurds have been some of the most stalwart allies of the US over the years; supporting military intervention as far back as 1991 when Iraq was invaded for the first time in Operation Desert Storm and have been a driving force in the more recent fighting against the Islamic State (IS) in Syria and Iraq. They are also the largest indigenous group of stateless people with around 25-30 million individuals living in Iraq, Turkey, Syria, Iran, and Armenia. All of which poses a serious foreign policy conundrum for countries like Turkey who have been battling an internal Kurdish rebellion since 1984, and the US who have armed and fought alongside Kurdish groups in Syria against the Islamic State. 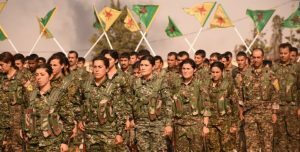 As a result, the Turkish government has labeled any Kurdish group fighting for independence in Syria as a terrorist organization including the Kurdish People’s Protection Units, who are the mainstay of the US-backed force that defeated IS, known as the Syrian Democratic Forces. This has lead to an international outcry from activist groups globally who have supported the independence experiment of the Kurds in Afrin, known as the Democratic Federation of North Syria. One of those activists hails from Norfolk, Virginia. Jacob George, an organizer with the Industrial Workers of the World (IWW) has helped organize a rally to raise awareness to the plight of the Kurds in Northern Syria. “They have created the kind of movement that is solidarity focused and worker-run, which the IWW has been pushing for since its founding in the early 20th Century.” This movement, according to Owen Jones at The Guardian, has been remarkable not only for its attempt at direct democracy, but for its acceptance of gender equality in a region long known for the oppression of women. Indeed, women fighting alongside men against IS in the Kurdish People’s Protection Units has been one of the most defining features of their experiment. 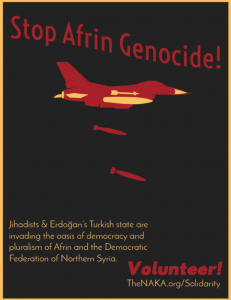 Each of these hallmarks of the Afrin experiment will be rallied for on March 24 at the IWW demonstration organized by George and his colleagues at MacArthur Center in downtown Norfolk. Yet, this is part of a larger show of solidarity for what is happening against the Kurds organized by the North American Kurdish Alliance (NAKA) and billed as an international day of action – with the NAKA calling for an “Immediate condemnation of the Turkish and jihadist invasion of Afrin.” McCredie was less optimistic about the future prospects of a Kurdish enclave in Syria, saying the regional powers will never support an independent region. Syria is the great humanitarian disaster of our generation. According to Human Rights Watch’s World Report for 2017, almost 500,000 civilians have been killed with another 100,000 detained or disappeared since the start of the civil conflict in 2011. The majority of the conflict has taken place in dense urban environments, which has led to an unparalleled refugee and migration crisis. 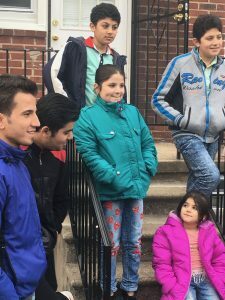 As the refugee and immigration debate rages on, RVA Mag, in partnership with the non-profit media company, AP Math Labs, traveled around Virginia and Maryland talking with Syrian refugees about their experience of civil war, displacement, and eventual resettlement in the US. What started as an exploratory conversation with refugee families, ended up becoming a three-part documentary series. The stories we heard were in drastic juxtaposition to the misleading information coming out of the White House. Therefore, when making these three documentary videos, we asked ourselves one simple question: Can you imagine a scenario that starts with the physical and emotional stress of living in war – surrounded by near-constant death and destruction – and then having to make a decision to put your family in greater danger to seek sanctuary elsewhere? This decision means traveling on roads controlled by a hostile regime that thinks nothing of killing their own people from the air and ground, facing terrorist groups like the Islamic State (IS), and being exposed to the vast network of unregulated militias, criminal syndicates, and foreign proxy groups funded by regional powers like Saudia Arabia and Iran, all for a chance to rely on the charity of foreign countries who sequester refugees in overcrowded camps that can maintain only the most basic standards of cleanliness and livability. What we rapidly came to understand is that the emotional and physical stress experienced by these families is impossible to understand unless you have shared this experience. This is the story we set out to capture. What we learned in this process was that for those who escaped the violence, there is little consolation living as a refugee. Research has shown that the 600,000 refugees in Jordan live on as little as three dollars a day. 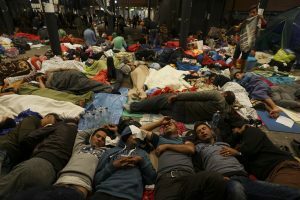 And as their ordeal continued, the negative consequences of being displaced persisted, such as forced marriages, child labor, and exploitation only increases. Almost half of all Syrian refugees are children under the age of 18, with the UN claiming 2.5 million are displaced – some have not been to school in years. Since returning home is not an option, applying for refugee status is the only real hope for families seeking to rebuild their lives. Yet coming to the US as a refugee is a long and arduous process. Contrary to what anti-refugee politicians and pundits would tell you, the process is defined by countless screenings, security clearances, and evaluations. 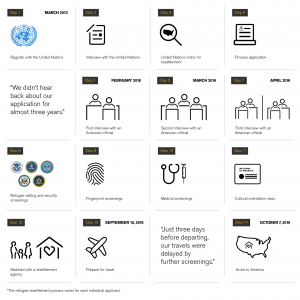 The International Rescue Committee, an international humanitarian aid organization has detailed an 11-step process for refugees, which takes anywhere from 18 months to three years for families to be cleared for resettlement. This includes in-person interviews, medical assessments, and cultural orientation – a family does not just show up at the airport and get let into the US. Starting tomorrow, RVA Mag will release one video a week every Tuesday for the next three weeks at 10:00 am. You will be able to find them on our Facebook page and in the Watch section of rvamag.com. The conflict in Syria, much like the conflict over our immigration policy, continues to rage on. What is lost in all of this is the people, families, and communities whose lives have been destroyed. The International Rescue Committee began resettling refugees in Richmond in November 2016. As Site Manager for the International Rescue Committee (IRC) in Richmond, I have seen refugees restart their lives and be embraced by this city. Nothing is more heartwarming that watching a city support those who are the most vulnerable. Nonetheless, on July 13, 2017, President Trump’s executive order, officially known as the Executive Order Protecting the Nation From Foreign Terrorist Entry into the United States and unofficially as the ‘travel ban’ took effect, suspending refugee resettlement for 120 days. So what does this mean in real-terms? The Supreme Court recently ruled that refugees must have a “bona fide” relationship with a person or entity in the US, in order to enter one of our communities. However, it is now up to the Trump administration to decide what is deemed “bona fide” and as a result, they have chosen to exclude grandchildren, grandparents, nieces and nephews. Because of this, women, children, men, and entire families are not able to reunite with their loved ones in the US. Instead, they are being left in war zones where their lives remain in extreme danger. The Trump administration has deemed these people to be a security risk, claiming that refugees do not receive thorough enough vetting before entering the US. This letter is correct, refugees have been a core component of our national tradition since the Mayflower sailed from England in 1620, and part of our foreign policy since the the Soviet Union started invading central European countries in the 1950s. Today, there are more than 21 million refugees worldwide with over half coming from Syria, Somalia, and Afghanistan. Put in a wider perspective, Lebanon, a country of only 4 million people, is now hosting an estimated 1 million refugees from Syria. This kind of humanitarian crisis has not existed since World War 2. For our allies and adversaries alike, refugee resettlement has been a powerful symbol of American leadership. And more recently, this has been a symbol of freedom for those seeking asylum from oppression in places like Iraq, Syria, and Afghanistan. The smear campaign against refugees did not begin with Trump, however. Many people don’t remember, but at the height of World War 2, the US turned away thousands of Jewish refugees fleeing Nazi Europe – most of whom were later killed in concentration camps. The IRC was actually formed in 1933 by a group of Jewish scientists and professionals, including Albert Einstein, as a way to protect people fleeing the worst kinds of war and conflict. Since the passing of the Refugee Act in 1980, more than 3 Million refugees have come to the US. President Reagan resettled around 660,000 refugees from places like Indonesia and the Soviet Union, more than any other president in history. Yet the level of fear mongering in today’s politics is entirely unprecedented since no US citizen has actually ever been killed by a refugee in a domestic terrorist attack. Statistically speaking, you are four times more likely to be struck by lightening than be killed by a refugee. Today’s global humanitarian crisis is the worst since 1945, there is no disputing this. And it is estimated that one out of every 115 people on the planet is currently displaced from their home. While the humanitarian plight of refugees is impossible to ignore, it is only one part of the equation. So what is it like to be a refugee in Virginia? The average time for refugee displacement in 2016 – from their country of origin – to the time they could enter the US is 16 years. Furthermore, it typically takes refugees three years to complete the rigorous vetting process, which involves five government agencies with additional security screenings for refugees coming from the Middle East. Even after this arduous vetting process, refugees may still wait many more years before having the opportunity for resettlement in Canada, Australia, Europe, or the US – less than half of one percent of all refugees will actually be resettled in the US. To have meaningful public discourse about how we can assist refugee families, we must learn how to effectively speak about it in our cities and communities. For instance, more than 600 refugees will be resettled in Richmond this year. Every individual that is resettled gets $1,000 of federal funds, which provides for housing, furniture, and groceries. This is $600,000 that is immediately injected into the local economy. Refugees also apply for the Supplemental Nutrition Assistance Program (SNAP) and Women Infant Children (WIC) benefits, both of which are federal funds that get spent at local Richmond businesses. Refugees are also expected to do what all of our immigrant grandparents did: work, provide for their families, and generate economy for our cities. Here in the US, refugees do not get long-term assistance like in Germany or Canada, where several years of housing and cash assistance is commonplace. The backbone of refugee resettlement in the U.S. is self-sufficiency through employment – just like everyone else. Another positive reality that is often over looked is that in 2016, 84 percept of all refugees became self-sufficient within six months. These are people who have an entrepreneurial spirit and are inherently motivated to build new and successful lives for their families. In this year alone, the IRC in Richmond has helped 92 percent of refugee families gain employment and become self-sufficient within 90 days of arrival. Refugees typically take low-wage jobs and work positions that employers often struggle to fill in the hospitality, warehouse, and food-service industry. Regardless, the end result is always a net positive for cities since refugees immediately contribute to local economy and start paying taxes on their income. After six months in the US, most refugees even start to pay back the cost of their airfare – there is literally no “free ride” to the US as a refugee. The American Refugee Resettlement system is an example throughout the world, and the refugee experience is one that should speak to all Americans that have an immigrant story in their family. Refugees are survivors, but they cannot do it alone. Refugee resettlement depends on a welcoming community, volunteers, and donated resources. To find out how you can get involved, please contact the International Rescue Committee in Richmond. As I prepared for the seminal RVA weekend of the year – GWARBBQ – I once again found myself in that strange place between being “here” and being “over there.” And how could you not, after seeing the pictures from Syria this past week?